Aside from rampant pessimism about the US economy, the mini-panic now swamping international stock markets is also being attributed to worries about the eurozone and the increasing likelihood that at least five members of eurozone will default on their debt unless rescued by the other countries. The problems of three countries, Greece, Ireland, and Portugal, have been well known for at least a year and a half. But the problems of Spain and Italy, which had been thought to be manageable and unlikely to cause a crisis, have suddenly become critical as well. Because of their size and the size of their debt burdens, it is unclear whether any rescue package would be feasible if the debt of all five countries had to be rescued by the eurozone governments. It has been fashionable to blame the crisis on the fecklessness of the politicians in these countries, the greediness of their public employee unions and the overly generous pensions that they have extracted from taxpayers, overly generous welfare benefits, and an unwillingness to work hard and save like the good old solid Northern Europeans. There probably is some truth in that assessment, though there is probably some exaggeration as well. However, assigning blame in this way is really a distraction from the true cause of the crisis, which is a stagnation of income growth, making it impossible to pay off debts that were undertaken when it was expected that incomes would be rising. Since the debts are fixed in nominal terms, the condition for being able to pay off the debts is that nominal income (NGDP) rise fast enough to provide enough free cash flows to service the debts. That hasn’t happened in the five countries now unable to borrow at manageable rates. 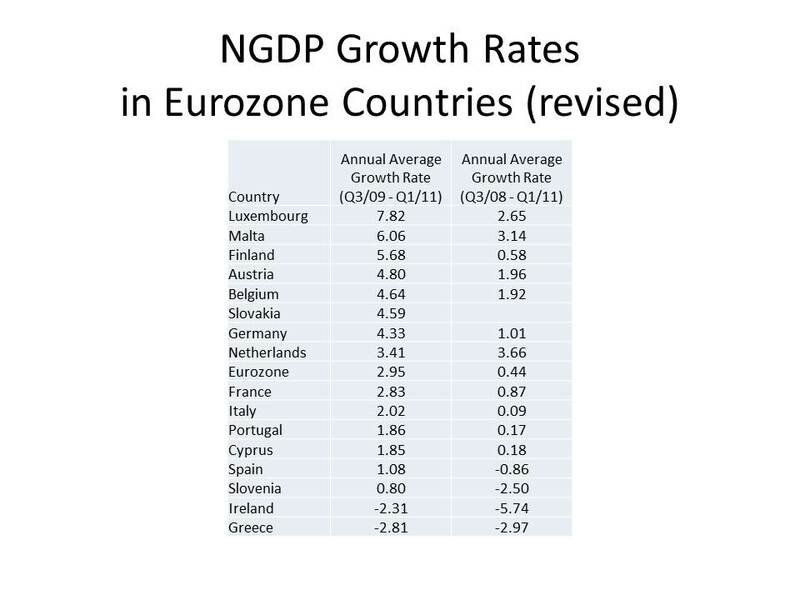 Using official data of the European Commission, I calculated the average annual rate of growth in NGDP for each of the 15 countries in the eurozone since the third quarter of 2008 when the eurozone went into recession and for each of the 16 countries in the eurozone since the third quarter of 2009 when the recovery started (Slovakia having joined in eurozone in the second quarter of 2009) through the first quarter of 2011. The five countries primarily implicated in the debt crisis are at the bottom of NGDP growth rates. The only other countries in that range are Cyprus and Slovenia. Cyprus bonds also seem to be problematic, but Slovenia bonds are still rated AA by S&P. The European debt crisis can thus primarily be laid at the doorstep of Chancellor Merkel and Jean-Claude Trichet, President of the European Central Bank who, in their inflation fighting zeal, have spurned calls for monetary easing to speed the recovery. We are now all reaping what they have sown. Chancellor Merkel is following in the worst tradition of one of her predecessors, the unfortunate Chancellor Heinrich Bruning, who in his obsession with proving that Germany was unable to pay off its World War I obligations to the Allies, drove Germany mercilessly into a deflationary spiral in the early 1930s paving the way for Hitler’s ascent to power. This time, Germany has largely been spared the pain caused by the tight monetary policy for which Chancellor Merkel has expended so much effort. The pain has mostly been borne by others. But Germany ultimately cannot escape the costs of its unyielding attachment to tight monetary policy. Mr. Trichet, too, can look for inspiration to the tragically misguided Emile Moreau, governor the of the Bank of France who presided over the disastrous accumulation of gold by France in the late 1920s and early 1930s that was perhaps the most important factor in triggering the international deflation that led to the Great Depression. UPDATE (11/25/2011): In working on a new post about the euro crisis, I discovered that I seriously misstated the growth rates from Q3/09 to Q1/11 for the eurozone countries reported in the above table. Although I got the numbers wrong, the general relationship among the growth rates in the various countries was not wildly off, so the mistake does not affect the central message of the post, but in my haste, I negligent in checking the numbers. There were also a few mistakes in the column reporting reporting growth rates from Q3/08 to Q1/11,but only a few of those number were mistaken, not the whole column, as was unfortunately the case for Q3/09 to Q1/11. Here is a revised table, which aside from correcting my own mistkaes is also based on revised data from the EU. Things would look even worse if you took the NGDP base to be the second quarter of 2008. In the 3rd qtr NGDP had already dropped significantly. I wonder why so many despise the lessons of history. The old adage that “you are then bound to repeat them” rings true. This is how the money powers increase their power. First through inflation then through deflation…systematically strangling the middle classes with debt that they know cannot be paid off. What’s the appropriate response in the US? Let’s assume Bernanke decides to target an NGDP trend. But the Europeans stubbornly refuse to do the same. What happens. My first instinct is US NGDP growth will largely materalize as inflation. Real output will stay low because Europe’s behavior is damaging the global economy. But I have not one clue if that’s correct or why it would/would not be. Axel Weber, former president of the Bundesbank thinks that mopnetary policy should remain narrowly focused on price stability. None of this “level Targeting” idea! First, off your blog is excellent. As part of my first comment, I’d like to note that I’ve found it to constitute an engaging educational outlet. On to your post, I perceive a potential flaw in your methods. You claim that torpid NGDP growth has engendered the debt crisis, because lower income growth among indebted countries has lowered tax receipts among them, making them more fiscally imperiled. But, insofar as your data encompasses the period from Spring 2010 to the end of Q1 2011, during which some of the fiscally imperiled nations involved initiated austerity packages, couldn’t it be biased by these packages? Since the fiscal contractions wrought by austerity have lowered GDP relative to its baseline trajectory, your contention that “the, true cause of the crisis, …. [is] stagnation of income growth,” is undermined by the possibility that debts incurred during a period of not-abnormally-low income growth caused the debt problem, and by the possibility that the low NGDP growth of debt-ridden countries relative to others in Europe results from a response to the debt crisis rather than is a root cause of it. 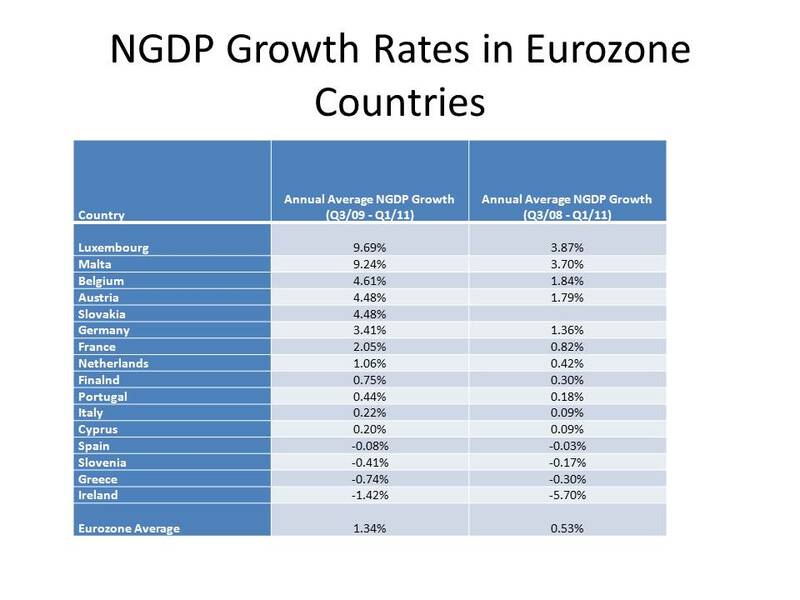 This would jive with the fact that Italy, which, only recently having come under attack and not therefore having legislated austerity under the time period in question, has slightly higher NGDP growth than Spain, Greece, and Ireland, which, to my knowledge, did. It’s probably true that low NGDP growth is part of the cause, but its importance may be somewhat mitigated when my criticism is factored in. . Your blog was mentioned in a leteer written by a Levey, former bigwig at Moody’s. Scott Sumner blogged about the letter, which is spot-on. Congrats, you are getting noticed. BTW, your blog of today is superb. I agree that Sumner and Glasner are important opinion shapers. That is why I monitor them to try and get an idea for when the next round of QE will really start. The timing of any monetary operations is critical for investment decisions and commodity price outlooks and it is nice to have more informal information on what the opinion makers are really thinking instead of the mainstream media propaganda blasts we the masses had to rely on in the past. How annoying it must be to the establishment that fewer and fewer people are dependent on the NYT, FT, War Street Journal etc these days. The euro is the Big Mistake; perhaps one of the bigger mistake in the history. Marcus, Yes, I thought so, but the Eurostat site that I was using only seemed to have GDP data going back to 3rd quarter 2008, so that was the best I could do while rushing to post the blog yesterday. Where could I get GDP data going back further? Also, since you are my unofficial consultant on such things, what is the best way to post a table to my blog. I was doing it by hand, but then I found that I couldn’t keep the numbers in a straight line down the page and spent almost an hour trying to get it to look even half way presentable. I will have to have a look at the Weber piece, I just saw it in the latest St. Louis Fed Review, immediately following James Bullard’s piece which I wrote about a while back. Gabe, My personal view is not as conspiratorial as yours, though I agree that the Fed has been making policy, at least since 2008, with a view towards increasing the profits of the member banks. But banks would be better served over the long term by an increase in the price level as Scott Sumner pointed out in his blog a short time ago. Manfred, Thanks for your kind words and thanks for your comment. You make a valid point, but I don’t think that it cuts against my argument. On the contrary the austerity programs of the countries with the worst debt problems were imposed on them as a condition of being bailed out by Germany, France and the other relatively solvent members of the eurozone. Since the immediate source of the crisis is slow or negative growth in GDP, budgetary austerity makes the crisis worse in the short term. Hawtrey has a wonderful quote on the futility of Britain’s attempt to maintain sterling’s convertibility into gold from 1929-31 during the onset of the Great Depression before finally giving up the old parity as hopeless in September 1931. I think it applies well to the euro crisis and I will try to find it and post it in the next day or two. Benjamin and Gabe, Thanks for your kind words. I didn’t even pay attention to the quote until you pointed it out to me. But I am not about to overestimate my influence. But it is nice to be noticed. Luis, I agree that the euro has been a mistake. It has been based on running monetary policy as if the ECB were the Bundesbank, which would not have been so bad if only Germany’s closest neighbors had joined, but it has been a disaster for the periphery and in the end Germany, too, will suffer from its monetary imperialism. Charles Goodhart wrote some very effective criticisms of the euro before it was launched, and it thought, based on what he wrote, that the euro might flop quickly. That was obviously wrong, but if you go back and look at what he wrote, you will see that he correctly identified the debt instruments of the member states as the weak link in the system that would eventually lead to a breakdown. Yes, I remember have read the paper of Googhard, but if you could send me the reference, please, I lost it. I think the euro is a problem that fall far away economy theory. When I clicked on the link it says “session invalid”. Try this, and explore. It´s not as friendly as FRED! Marcus, I looked at the tables you linked to, but they only give annual GDP. I was using quarterly GDP. I will try to redo the table and re-enter it in a little while. Kind of late, but better late than . . .
Luis, I looked through my files and I think that the paper that I was referring to is this one: The Two Concepts of Money: Implications for the Analysis of Optimal Currency Areas. The published version is here, a working paper is here. I told you it wasn´t user friendly, but you can choose the frequency. The default is annual. Marcus, What do you think of the table now? Is it too small? I didn’t see any options for adjusting the frequency. When I have time I will go back and look. If you click on the table it shows up nicely. But when pasting it on the post you can choose “full size” on the options. I´ll send to your email the NGDP numbers for the countries on the table sice Q1 2007. I agree with the article and think its interesting but I almost didn’t even read it. The pictures of the guy to the sides are so distracting I couldn’t even focus on it. I had to block it off and copy it into a word processor. My advice is make the website a bit less annoying if you want people to read anything in it. Jack, I have trouble understanding how the picture of an old, somewhat dour, white guy with horn rimmed glasses could be so distracting to you. But I am glad that you were persistent and found a way to read this post without having your concentration disturbed. Good job! You can also use a reader. That dour old white guy has yet to make an appearance in my Google Reader! d.thomas, You should try it the other way, after a while the old boy starts to grow on you. What’s the average for eurozone in the new calculations? Mikko, Sorry, I put the Eurozone average (2.95%) in order (number 9, 8 above and 8 below).